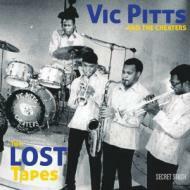 For almost 45 years a complete album of Vic Pitts & The Cheaters tapes has been forgotten, waiting to be released until now. In the late 1960s, Vic Pitts & The Cheaters were one of Milwaukee’s top R&B bands. They had their own TV show, played some of the city’s biggest clubs, and backed up big name acts. Between 1969 and 1970 they recorded over a dozen songs with producer Andre Williams at Chess’ Ter-Mar Studio. The results show why they were such a popular live act; some tracks reveal their roots as James Brown fanatics, others relate the happening sounds of Sly & The Family Stone and Chicago’s first record.